Each year the students in the Art program at H.B. 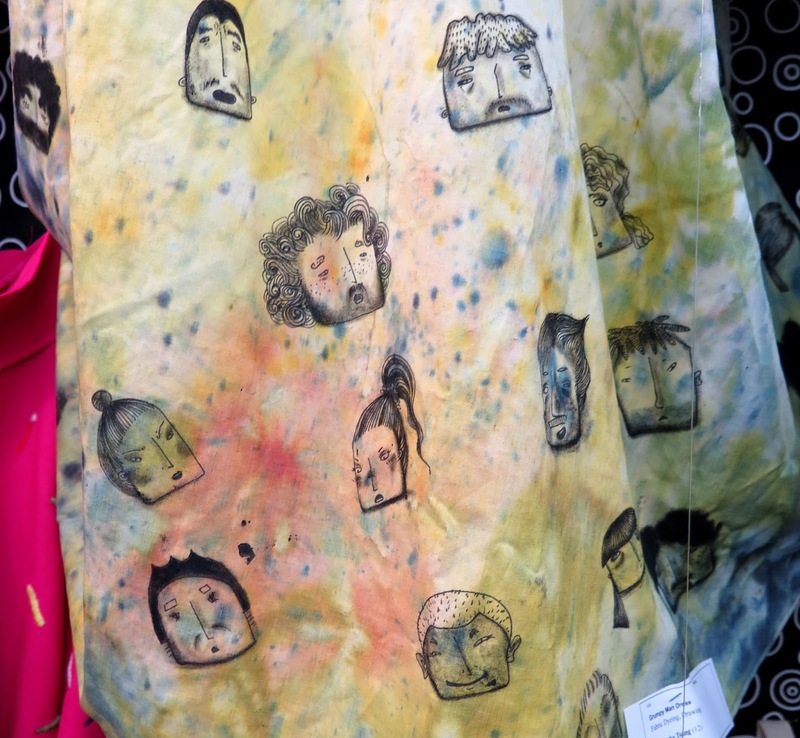 Beal Secondary School here in London have an end-of-year show of the work they have created. The BealArt program is very well-respected, and many talented Canadian artists attended classes, or taught there. The students can take classes in sculpture, drawing, photography, painting, print-making, ceramics and textiles. I enjoy seeing all the students' work, but especially that of those select few who have already found their voice, so to speak, and have the talent to translate their ideas into a work of art. I always start my tour with the Ceramics Studio, where I have seen some beautifully creative work in porcelain, clay and stoneware over the years. This year the first thing that caught my eye were these stunning porcelain pieces by Tiffany Nichol. I can't imagine the number of hours of work that went into creating the various pieces of marine life. The piece in the bottom right corner was used as the poster image for the show. 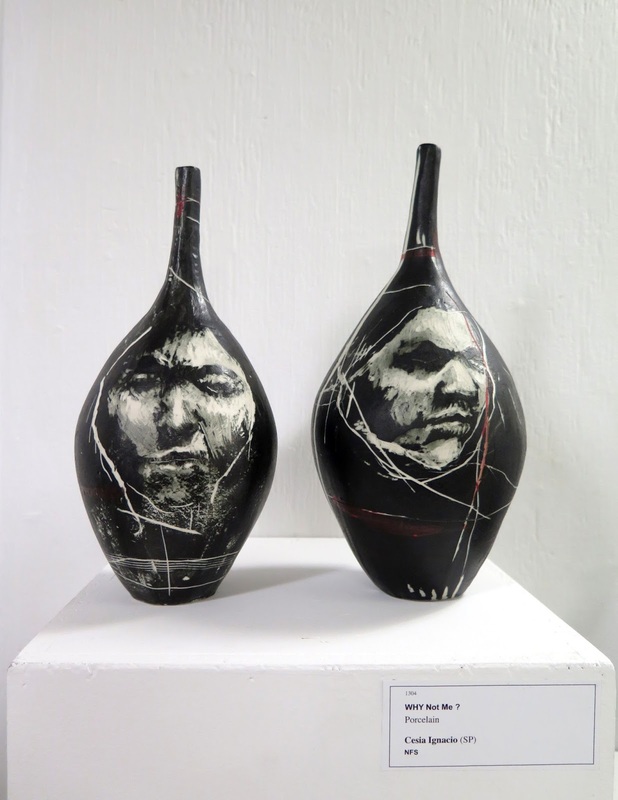 Another artist who demonstrated a style of her own was Cesia Ignacio, who incorporated her own face into the design on her porcelain pieces. 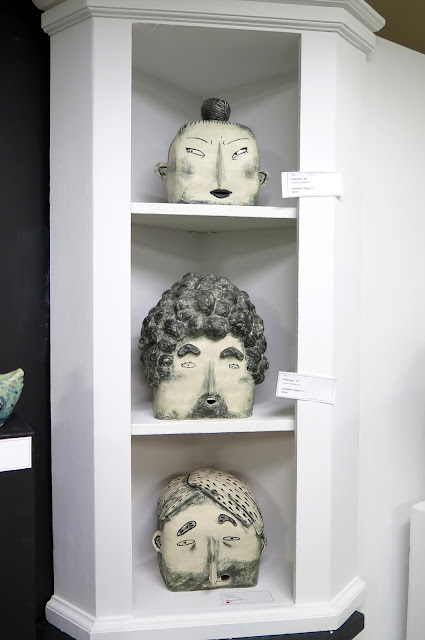 I really liked these stoneware heads, made by Samantha Tsang. The heads appeared as a pattern on a dress that was on display in the textile studio. 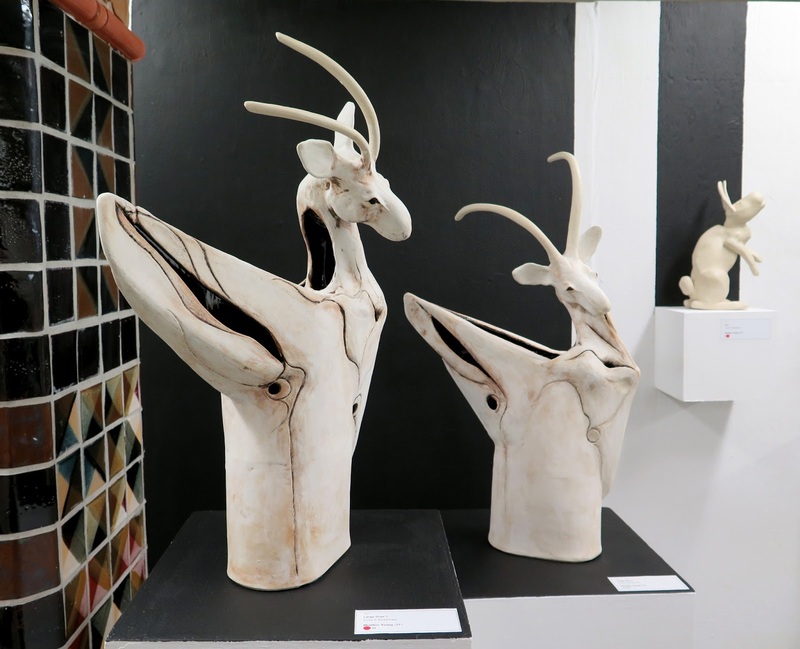 I admired the shape, and treatment on these Stoneware Oryx by Heather Young - they looked modern and primitive at the same time. 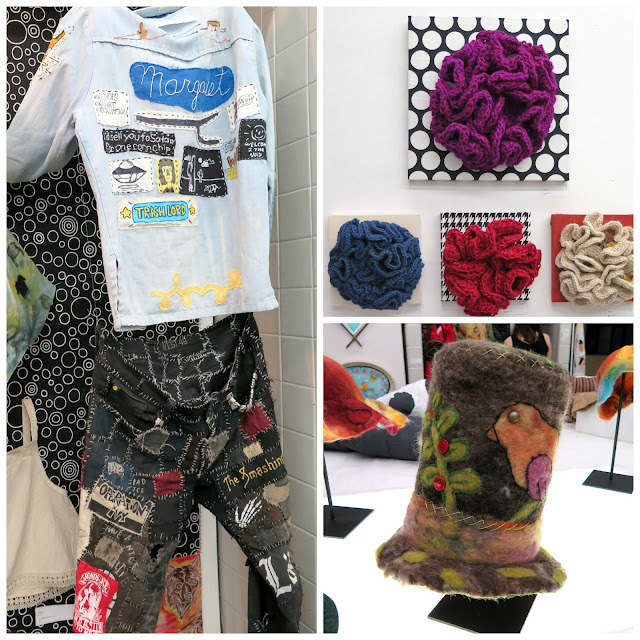 My other two favourite mediums are sculpture and textiles. 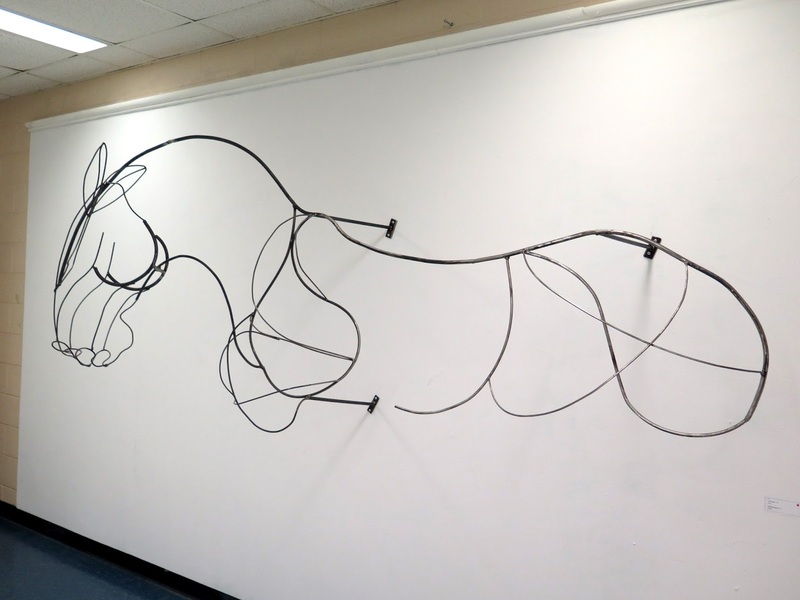 This giant (it appeared to be at least 8' long) steel horse made by Faith Robinson was sold - I hope whoever purchased it has a very large empty wall to hang it on. At first I couldn't figure out what this wire sculpture made by Mason Nesbitt represented and then after I read the title ("The Jump"), my eyes adjusted and I could see the figure in various stages of a giant leap through the air. The more I looked at it, the more I liked it. One piece of sculpture that was definitely more statement than decoration was this pregnant female torso constructed of cigarette butts titled "Born in Addiction" by Danielle Harris. 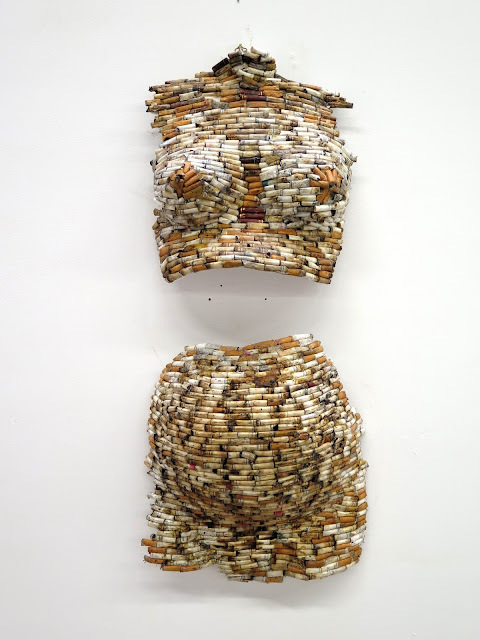 It was a powerful piece that spoke to the dangerous, and repulsive aspects of cigarette smoking (including the smell). The Textile Studio was my last stop where I found colourful crocheted barnacles by Jaymz Ropp, (top right), a felted top hat made by Cassandra Robinson, and on the left, a jacket by Rachel Simpson and pants made of found materials by Matt Meiller. 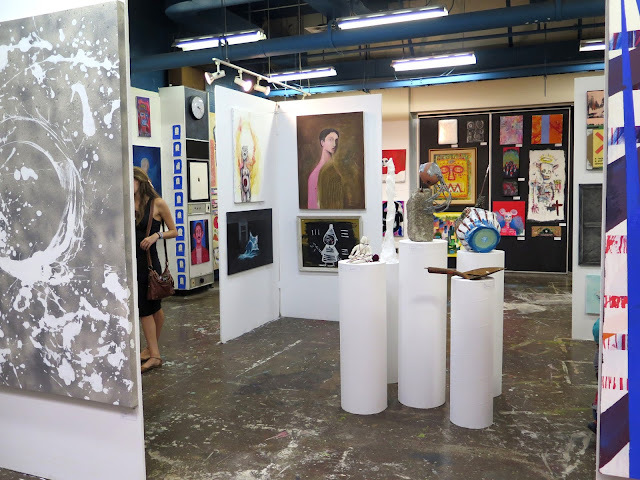 The BealArt year end show runs for three days every June It provides an excellent opportunity to see the work of up and coming artists and as most of the work is for sale, you can pick up a new piece of art for your home at very reasonable prices. Put it on your calendar for next year! 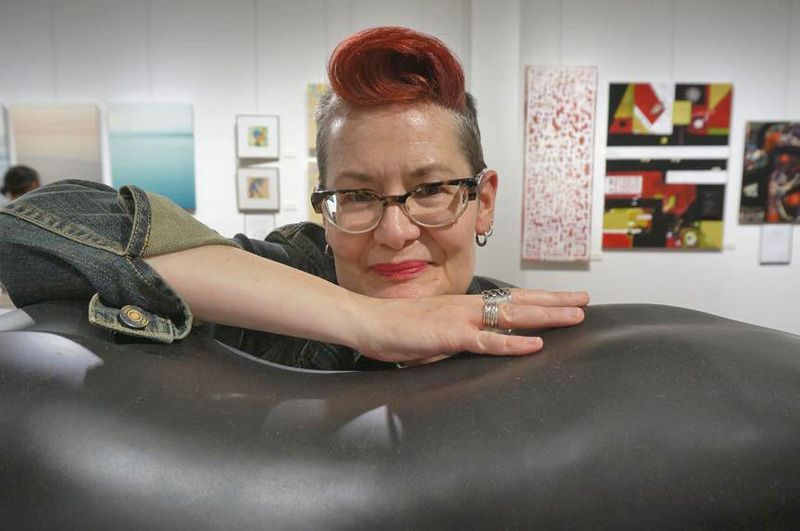 And, just because...a couple of gratuitious photos of yours truly taken by random folks during the Fringe Festival..
Richard Gilmore, Communications Coordinator at The Arts Project, took this photo of me during the Fringe Festival, and I rather liked it - yes, I am leaning on a torso-shaped piece of art. Heidi Wholeness, aka Patti-Ann Sim, owner of the Dear Thelma Love Louise craft trailer seen in my previous blog post, took this shot of my attempt at hula hooping on Saturday. 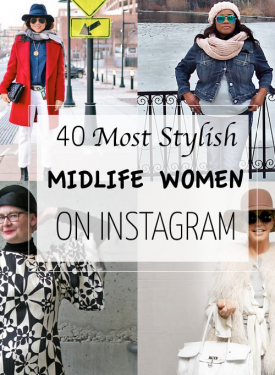 Check you out, hula hooping! What a lovely cluster of creativity! And hula-la-la! Having been a mature age student at art college recently, and been on the other end of the end of year shows, I know your presence and advertising will be much appreciated! 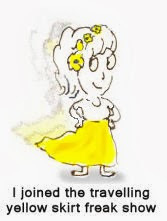 I love the sea ceramics, the iron horse, the jumping man, the oryx and the hula hooping woman! Wow, those shells are amazing! That's so much detail and work! 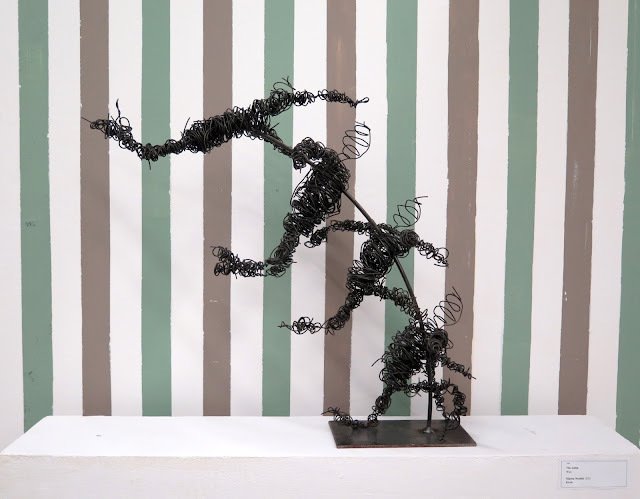 I love the wire sculptures, especially "Jump" - I would buy that, but Vizzini would chew it up, I'm sure. That wire horse is spectacular! I want it. I cannot imagine going around and collecting all those cigarette butts. The final image is provocative though. I love the shot of you hula hooping! When I see this artwork I'm screaming inside - hands off art school!, I don't want you to ruin these talented people. Amazing work. So much talent it's hard to believe. Too bad we don't have some surfer music to go with your hula-hooping. Great photo. And the one of you on the torso is one of my favourites as well. I'm glad you're finding interesting things to do over there - you always do! 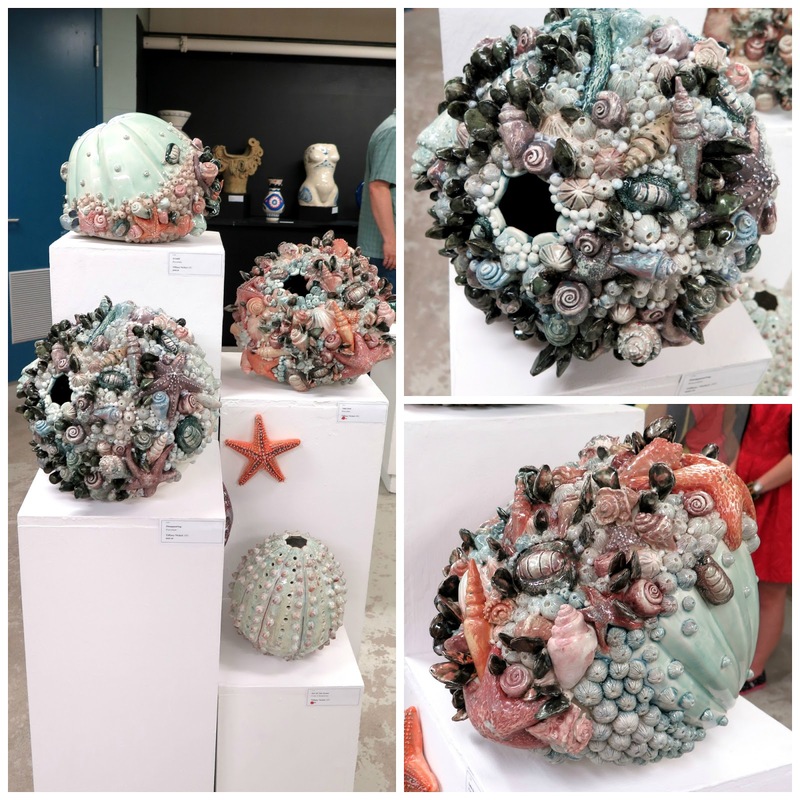 love those sea life ceramic pieces, such amazing art pieces!, and also love all those prints and designs, there's a lot of talent involved! 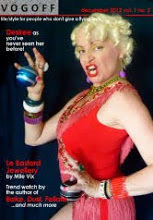 And you look very concentrated when hulahooping! I love your perspective on art - so quirky and colourful. Great coverage of an interesting show. 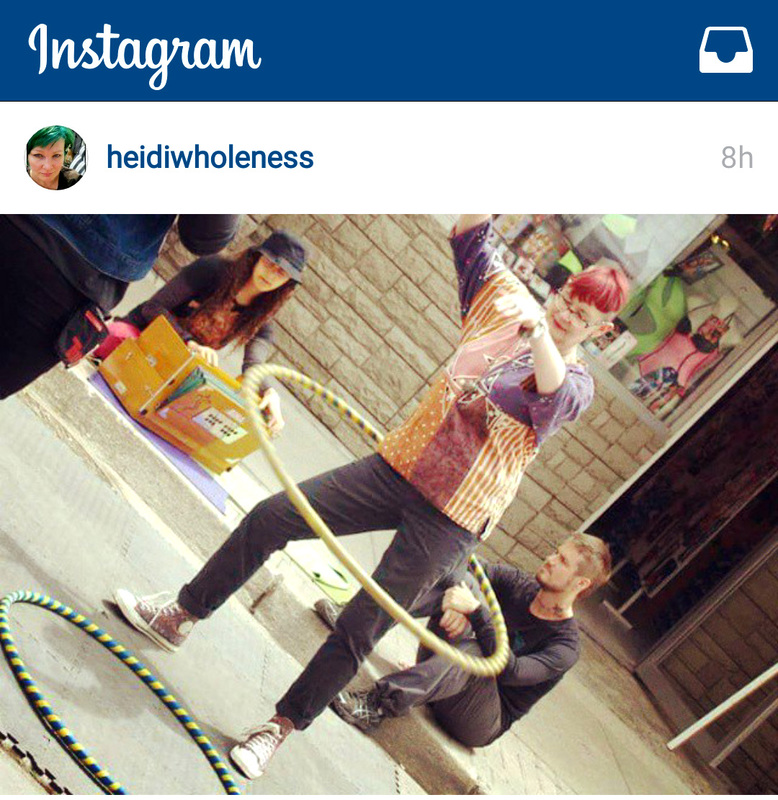 Love your hula hoop photo. You look adorable!